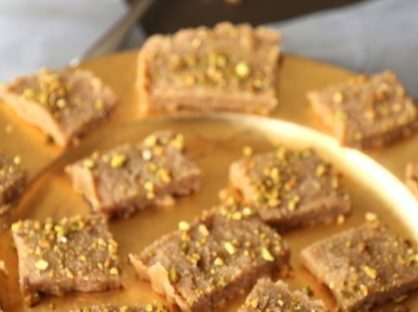 I use some semolina in this recipe because it makes the halwa easier to slice. Toast the whole almonds and 2 tablespoons of ghee in a large non stick skillet on medium heat for 5-7 minutes, stirring to prevent burning until golden and fragrant. Remove from pan and cool. Add remaining ghee and semolina and toast stirring constantly about 4-5 minutes. Grind cooled almonds to a smooth paste. Add to the semolina and toast another 2-3 minutes. Add the sweetened condensed milk and stir for 20-25 minutes until the Halwa pulls away from the sides of the pan and begins to resemble a sticky dough. Sprinkle with saffron and stir well. Remove from heat and allow to cool about 25 minutes in the pan. Lightly grease a 12 by 12 inch tray with melted ghee. 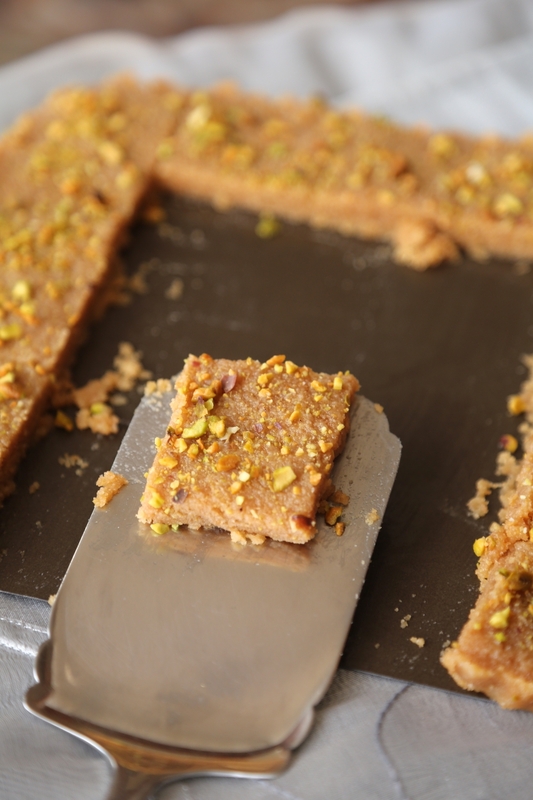 Spread the badam halwa over the tray with a spatula and smoothen to create an evenly thick layer. Cover with plastic wrap and refrigerate 3-4 hours. Remove and slice into desired shapes and sizes. Cover with plastic again and refrigerate 3 hours. Remove and gently ease each piece onto a serving tray. Let sit 25 minutes. Serve. Alternatively you could wrap each piece into wax paper and twist both ends to form an individual piece of candy. HEAT VEGETABLE OIL IN A PRESSURE COOKER OR LARGE DUTCH OVEN STYLE POT ON HIGH HEAT. ADD ALL THE SPICES FOR TEMPERING AND COOK ABOUT 60 SECONDS. ADD THE PUREED TOMATO AND ONION PASTE AND COOK ON MEDIUM FLAME ABOUT 10 MINUTES, STIRRING TO PREVENT BURNING EVERY 3 MINUTES OR SO. 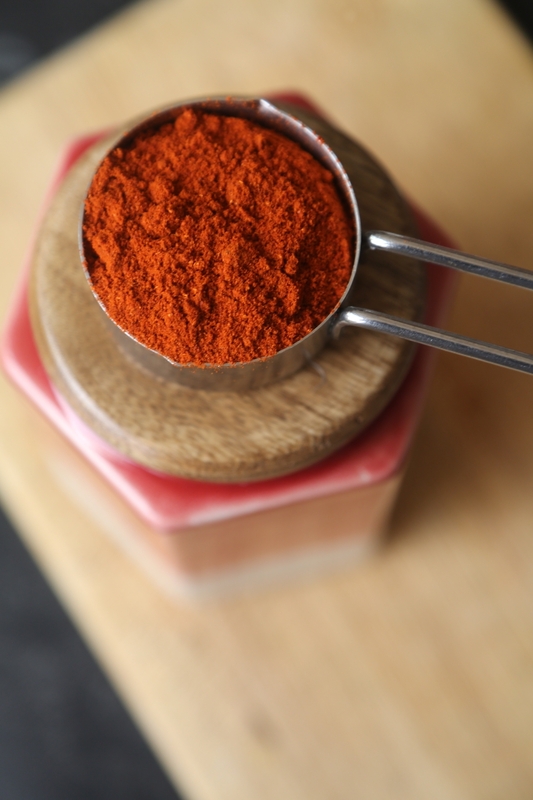 THIS MASALA WILL SPLUTTER AS IT COOKS SO COVER PARTIALLY WITH A LID WHILE COOKING TO ALLOW STEAM TO ESCAPE. 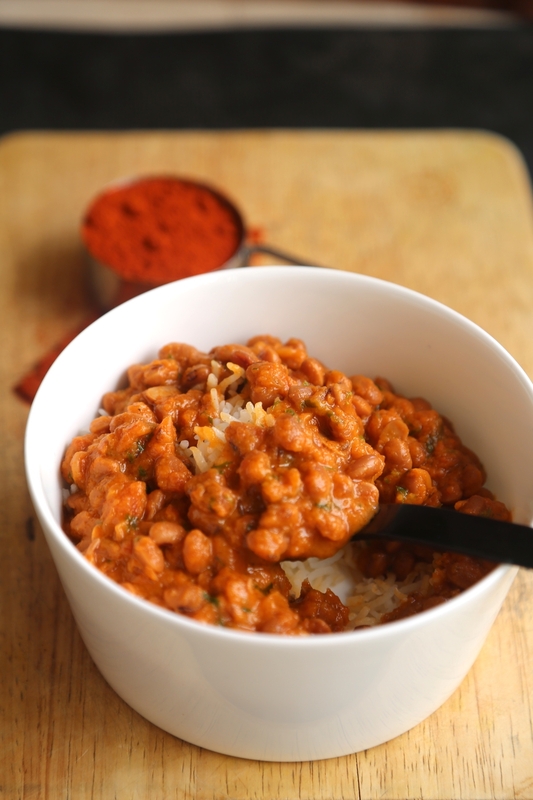 WASH THE BEANS, DRAIN AND ADD TO THE TOMATO ONION MASALA. ADD 1 LITER WATER, 1.5 TEASPOONS SALT AND COOK UNTIL BEANS ARE VERY TENDER ABOUT 4 WHISTLES OR 45-60 MINUTES. COVER AND STIR FROM TIME TO TIME TO PREVENT BURNING IF USING A DUTCH OVEN. IF YOU ARE USING A DUTCH OVEN WATER WILL EVAPORATE FASTER SO ADD MORE WATER TO THE BEANS AS REQUIRED FOR A THICK GRAVY IF THE BEANS TAKE LONGER TO COOK AND THE LIQUID DRIES UP. ADD A 1/4 CUP OF WATER AT A TIME AND STIR. OPEN PRESSURE COOKER OR DUTCH OVEN AND STIR IN COCONUT MILK. COOK OPEN ANOTHER 5-6 MINUTES. Sunday Masala is a Maharashtrian specialty with Malwani influence. It is a masala made at home and reserved for special Sunday family meals that generally involve some kind of meat or fish. But this masala is very versatile and adds flavor to dishes made with baby eggplant, ash gourd, chicken, fried fish and various curries. Keep refrigerated in an airtight container for up to 6 weeks. Many of the esoteric ingredients such as Dagadphool and Nagkesar are exclusive to the Konkan coast and maybe available on special order online or at a specialty spice store. In a clean and dry skillet or tawa, toast the grated coconut and khuskhus on a low flame about 4-5 minutes until fragrant and lightly browned. Remove and cool. Toast all the other ingredients together in the same pan or tawa over low heat, until aromatic and golden about 10 minutes. Cool completely. Grind all the ingredients together to make a smooth powder. Refrigerate in an airtight bottle.